An amateur proof that the puzzle game Net is NP-complete. 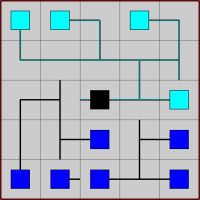 The puzzle game Net, also known as FreeNet or NetWalk, is played on a grid filled with terminals and wires; each tile of the grid can be rotated and the aim of the game is to connect all the terminals to the central power unit avoiding closed loops and open-ended wires. We prove that Net is NP-complete. This entry was posted in CSTheory and tagged computational complexity, NP-complete, NP-completeness, Puzzles by admin. Bookmark the permalink.